The map is represented as a dual mesh. 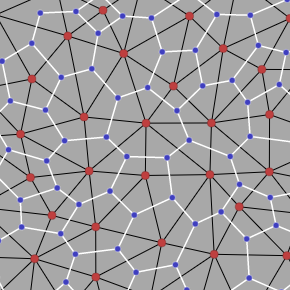 There's a Voronoi region mesh that is drawn with the red points representing regions, blue points for vertices, and white edges for the polygons. There's also a Delaunay triangle mesh that is drawn with the blue points representing triangles, red points for vertices, and black edges for the triangles. This creates a binary tree for each river. There are multiple rivers, so that makes a binary tree forest. 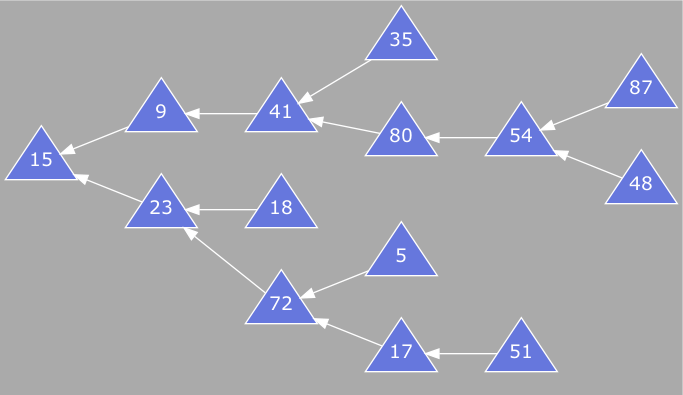 A common representation of a binary tree is to use a node object that has pointers to a left child and right child, either of which could be null. That structure makes it easy to go from the parents to the children. It also makes it easy to insert and remove children. For the map generator I only have two passes over the tree structure, and I don't need to modify the tree. 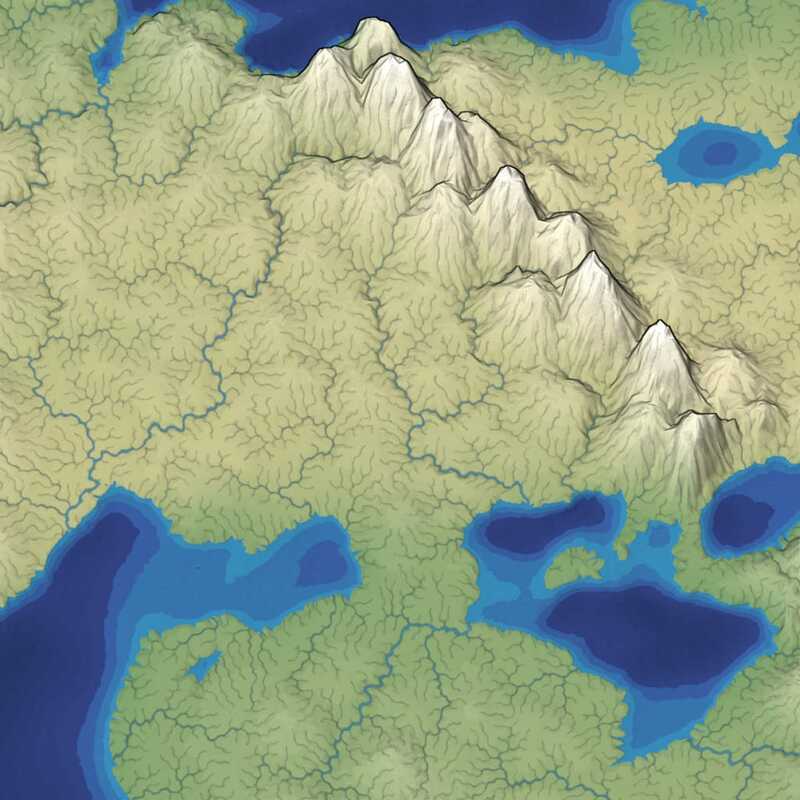 Construct the tree by starting from the coastlines and building rivers uphill. I start with the mouth of each river and go uphill, creating bends and forks until I end the tree with springs. This pass goes parent to child. Simulate rainfall by going the other direction. I start with the leaves and make water flow down to the parents, down through the tree until it reaches the coastline. This pass goes child to parent. The child nodes are always after the parent nodes. For example, in the tree, node 80 is a child of node 41, and in the array, node 80 at position 7 is after node 41 at position 3. For example, when visiting position 7, I would calculate the rainfall at node 80, add that to 80's river flow, see 80's parent is 41, and add 80's river flow to 41's river flow. The standard representation of binary trees stores children at each node; I instead needed to know the parent of each node. I'm using an array of integer representation instead of the usual tree of objects representation. I mostly picked this to avoid memory allocations — I can allocate it when the program starts and then reuse the array — but it may also be slightly more cache friendly. I'm pretty happy with the way the rivers work right now. One additional step I considered was to iterate forwards and backwards in the array again to make canyons look nicer. Right now there aren't that many canyons and I don't want to slow things down so I'm going to skip this for now. I want to finish this project soon so I'm declaring feature freeze. I am going to fix bugs and add UI for things that currently require editing the code. I'd like to improve performance but that can wait. I'd like to improve the visuals but that can wait too.